Trevor started out as a programmer in an engineering firm, moved to a software house and then on to ICL/Fujitsu, where he worked in a variety of customer service and support roles until he was made redundant. He then worked for Barclays Bank, managing the IT support teams in five Contact Centres across the UK. He elected to take Voluntary Redundancy at the end of 2009. He has used Microsoft Applications extensively on a daily basis for the last 16+ years. He spends quite a lot of his spare time answering questions on Excel and VBA at the Excel Forum. One of the posters asked him to do some work on a spreadsheet for him and, when this was extended into other projects, it prompted him to bite the bullet and set up in business as an Excel consultant. Towards the end of 2012, he worked on a project with a colleague in a local Business Club and the finished “product” is now in use every month. This spreadsheet automates a manual process that takes around 10+ hours each month for the current client base. The workbook automates the process and runs in just one minute, copying files, saving them as PDF files, producing invoices and drafting emails with data extracted from the reports. Besides being much, much quicker, the risk of human error is minimised. A side benefit is that he now has a client database where he can store and maintain all his clients’ contact details. Further applications could take advantage of this client database, for example, automating sales and marketing emails and updates. Trevor worked with a Retail Consultancy in the South of England helping them to develop an exciting new product. He provided advice, guidance, ideas suggestions, support and prototype code to be incorporated into the design of the tool. He also worked once more with his original client in Ireland who again required assistance turning a concept into reality. Current clients include an Insurance Claims Management Company and a Press Manufacturer. He has also provided one-to-one Training on Excel to a client working for a retail food distribution, sales and marketing company. Trevor's focus is on Excel, automation of labour intensive and/or repetitive tasks using Visual Basic for Applications, and integration with other Office products, for example, Outlook and Word. That decision was based on the simple fact that he truly enjoys working with Excel … someone has to. He does get asked what else he can do, as the Excel focus is seen as “limited”. He's not sure he agrees with that view, but people don’t realise how powerful Excel/VBA really is. However, he has a lot of expertise with Word, PowerPoint and Outlook, and has used other Microsoft products, such as Access and Visio. He also has a lot of experience of reviewing, producing and documenting Processes, Procedures and Checklists. He has a good knowledge of the English language and he enjoys proof reading documents and reports, structuring and formatting MS Word documents, and so on. 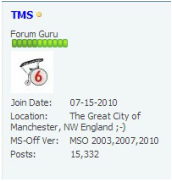 He is a member of the Federation of Small Businesses, a Member of the British Computer Society and he is an ITIL qualified Service Manager (red badge). He is insured through Simply Business. If you have spreadsheets that could “look better”, formulae that produce errors, want to know how to make your spreadsheets more efficient, would like to automate repetitive or labour intensive tasks, want to integrate other applications … or just want some general advice on Excel, Excel Aid can help you. Trevor does not charge for initial consultations, so you have nothing to lose. He will be able to tell you straight away if he thinks he can help you and give a rough estimate of how long it might take him. It’s quite often a case of “how long is a piece of string” though, so he prefers to work on the task and provide a draft solution. This will give you a better idea of whether or not it’s what you want/expect, and how much time will be involved. If you’re not happy with the approach, or you simply don’t want to proceed, there is no charge. Once he has produced a solution that works for you, it can always be tweaked and bells and whistles added later, if required.